One problem with big housing and neighbourhood renewal projects is that they necessarily demand a lot of structures for management and community engagement ... but when the money goes you can end up with a lot more breaucracy and committees than you really need. This was highlighted recently in a fascinating discussion with a couple of officers from a big housing estate that has benefitted from some £300 million of public and private investment over the past 12 years. The 10,000 people living on the estate now have much better homes, a safer and more attractive environment, rising education standards and better employment prospects. It has been done through enormous hard work by local politicians, officials and many residents who became representatives on committees and forums, and volunteers running local projects. They were motivated by the strong desire to tackle some really tough problems in the 1990s - and the chance to have a real say in how money was spent. But as one of the officers said, in match terms it is really only half time. There's a lot more to be done in helping people feel their regenerated neighbourhood is a friendly and safe community, and to continue to care about the improvements. To this end there is now a neighbourhood partnership, a trust with some money still to spend, a set of forums for education, environment, health and other issues, and a scrutiny panel for residents to keep an eye on how all this performs. The trouble is that many people are suffering participation fatigue. The core resident volunteers and committee people probably number about 30 ... and most if not all are over 60. How to re-energise involvement and bring new people in? I was joined in the discussion by old friend Kevin Harris, who blogs knowledgeably about neighbourhoods, informed by his Local Level consultancy work. For the past few years Kevin and I, with another colleague Drew Mackie, have been pushing the case for informal methods to help build communities: mapping social networks, storytelling sessions, using a mix of informal events and social software, as I wrote here and here. We enthusiastically expanded on these ideas. Instead of trying to recruit people to committees, why not consider whether these are really needed. Could their functions be fulfilled in other ways? What's needed is ways to offer people information, help them communicate and collaborate, tell their stories, get organised - and make their voice heard when something comes up that concerns them. This could be done in large part by mapping the many networks and communities of interest on the estate: friends and families, sports, hobby and church groups, school and work networks. From this is it possible find the natural 'connectors' in communities, see where the gaps may be, and develop or enhance channels for communication and engagement. Ah, said one of the officers, sort of going with the grain of the community, instead of trying to impose more structures? Treat people as individuals instead of consultation fodder. Exactly. And so we came up with 'governance with the grain'. The next step is a visit to the estate, meet the locals, and see if our theories stand up to a reality check. Some may turn out to be passionate about committee meetings, but I somehow doubt if that goes for the majority. When talking about the need to challenge hierarchies, promote more user involvement, support those with least influence but most need it is convenient to talk about being more bottom-up, less top-down. But I'm feeling increasing uncomfortable about using the term, because it implies that power relationships are easy to understand ... them and us, big and small, sensitive and insensitive. In practice most situations are highly complex with lots of different interests with differing degrees of influence. Of course, people are marginalised, power shifts are often needed ... but as I've tried to say elsewhere we need to borrow from thinking about systems, networks and the Net to understand what tools and processes may be most effective in bringing change. If we accept influence is partly about nodes, connections, knowledge flows - and these don't map on to simple architectures of top-down and bottom-up, what terms do we use in describing a shift in influence. More outside-in doesn't really do it. Drew Mackie and I have been talking to organisations a lot recently about different types of networks - join us (really a hierarchy), join up (clusters), or join in (a more fluid mesh). Shown the diagrams and descriptions organisations developing networks usually say they want something flat, democratic and fluid. But as soon as we start on the practicalities of who can do what, who can connect to whom ... who controls the communication systems for example ... we are usually back into hierarchy. When we have the language, we may have the culture shift. The online Pledgebank, which enables people to promote good ideas by saying "I will if enough of you will", has succeeded in helping launch a new campaigning organisation. It could have wider implications for the nonprofit sector and anyone trying to do good stuff without ending up driven off course by the wishes of funders. What makes this unprecedented is that a brand new campaigning organisation with a self-sustained funding stream has come into existence effectively from thin air, and, crucially, without the benefit of any one rich person or foundation dropping thousands into it. Pledgebank was uniquely effective in situation because if someone had just said "Will you set up a standing order of a fiver a month to my account so I can set up a new organisation?" nobody sane would have taken part. I need some of your expert advice ..... my question is this - how can I go about telling the voluntary sector about this new way of doings things? I am an accidental member of the voluntary sector, and I don't really know the first thing about magazines, websites, news bulletins, conferences or any other way in which news spreads. Can anyone give me any tips? Who could resist helping? My suggestion - besides various magazines in the field - drop a line to John Howes at the VolResource newsletter, now blogging here, and Ruralnet's xPRESS Digest. The Pledgebank approach clearly has implications for anyone in the nonprofit world tired of the old round of funding and grant applications. It provides a more robust financial base, and perhaps the chance to keep the aims of an organisation less open to influence by a small group of investors. There may, of course, be other problems if pledgers don't like the way that things are going and start cancelling their standing orders. No bad thing if it makes social entrepreneurs and others nonprofit leaders pay attention to their supporters. OK when the pledgers are those who benefit from the campaign - as in this case. More difficult when the pledge is to help others who won't have a vote via their contributions. Maybe mySociety has something cooking on networked governance... and anyway not so much and issue when the pledge is for action rather than funding support, as many are. I suspect the secret is to aim low and make it fun too. Forest Gregg succeed with his pledge to "start a free web service that matches teachers and learners but only if 4 other local people will join me at a dinner to talk about the idea and consider helping out". Former intelligence agent Matthew Burton provides a couple of insights from his world that have much resonance for me elsewhere. First, that networks reflect the culture of the organisations that run them, and second the importance of self-publishing to release creativity and challenge hierarchies. Matthew offers these in a comment to the item I wrote about his article on intelligence agency knowledge systems. I've been to a couple of meetings in recent weeks where a day's discussion among participants drawn from a wide range of backgrounds, and mainly freelances, released a wealth of ideas for the convenors. In each case the purpose of the day was to develop ways forward for the organisers, working with the freelances - but of course people also saw many ways in which they could work together in pairs and groups without detriment to the central purpose. The network energy could add to the centre. As each meeting closed, I made the suggestion, prompted by comments among participants, that it would be a good idea to have a better-than-email system to enable people to share ideas and work together since there were no plans for a further get-together for some time. I offered to set up a 'neutral ground' system since nothing was in place. In each case the response was the same .... don't do that, we'll get around to doing it. They may... but I'm a bit sceptical, and by the time they do the momentum will have gone. I don't have a great desire to manage yet more network communication systems ... whether email lists, forums, wikis or Basecamps. I was simply saying we needed something good-enough quickly so that we can build on the social and enterprise capital developed. If the organisers had been social software enthusiasts, committed to a self-publishing, distributed approach to networking I would be fairly sure they would follow through quickly with a system we could all use flexibly. In the the two cases I mention the organisers didn't have that experience and I suspect instinctively reacted against losing control. They were fine about people making contacts during the day, and developing ideas together. They could see what was going on. But the notion of that common space continuing somewhere else, in a way that they didn't control, was problematic. I'm perhaps being a little unfair because in each case it was a rushed conversation at the end of the day ... but I think I am right in detecting some instinctive anxiety about giving people a space with freedom to publish and a network structure different from the tightly moderated approach in the workshops. A little self-reflection makes me think that behind my practical suggestions was also a desire to offer up that challenge. The great thing about social software is that the individual has that capability. In future I'll try and raise it earlier in the day. * Where the mainstream media are not very responsive – e.g. the fuel protests were not taken seriously by the press until after it had already scaled up. * Where a campaign wants to scale very quickly, often for a short time – e.g. a ‘flash protest’ where protests come out of nowhere, then disappear again. Kent Police will shortly launch a new communications system to link together crime prevention projects throughout the county. In the process it looks as if they could demonstrate the sort of community messaging systems needed for town and country ... and show, of course, just how pervasive crime and security-related systems are becoming. 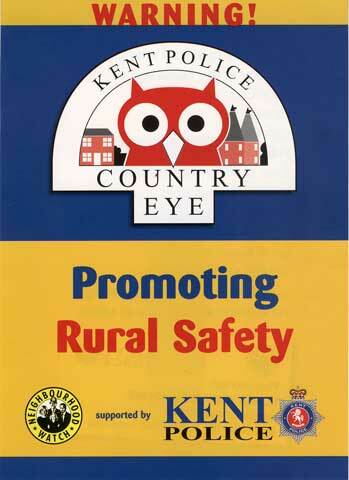 I came across the Country Eye project on a stand at the recent Ruralnet UK conference, where PC Michael Wright was explaining that the system will enable news of crimes, and other alerts, to be sent out via text, telephone, email and fax to anyone interested. There will be a web site with discussion forums to focus on community safety issues. Although the promotional focus is on rural areas - where isolation compounds people's concerns - the system will operate in towns as well, linking police, community Support Officers, Wardens, Special Constabulary, Parish Councils, Neighbourhood Watch groups. businesses, community groups and interested individuals. The Police are particularly proud of developing a system than can cross geographic and bureaucratic boundaries, involves substantial numbers of volunteers, and links seamlessly to their internal systems. Getting security right on that requires substantial testing, so www.kent.communitymessaging.net isn't live yet. Apparently eight other police forces are interested in the system, so it may be coming to an area near you shortly. No doubt there are downsides to these systems, but I was impressed by the enthusiasm and openness of the Kent team. A report from the New Local Government Network called Invisible Villages - techno-localism and the enabling council promotes social software as a major force in connecting with local communities and developing networks. "Social software is an increasingly popular tool for the development of voluntary, bottom-up social networks. Already, some social network sites, such as Orkut, have become popular amongst certain niche communities, as ways of building new relationships on the back of existing ones. E-mail and instant messenger are much more common parts of a typical social life. Informal and private socialising is not in itself a sphere where government has a role, but it is worth recognising how beneficial these technologies can be to communities and individuals”. The report is by Anna Randle of NLGN, with James Crabtree and Will Davies - who worked together at iSociety, and are now moving to to IPPR. I expect we'll hear more at an iSociety event next week launching another of Will's reports, and the IPPR Manifesto for Digital Britain event. “New technologies offer councils a new and exciting opportunity to exercise their new enabling and pluralist community leadership role, in a way which can help them respond to diverse and complex needs, enable communities to find the resources within themselves to articulate and meet these, and to balance conflicts which might otherwise not be recognised." As I have written before, I'm sceptical about the potential for techno-engagement at local level. The tools can certainly be an important part of the communications and engagement mix, and social networking models are a good way to unpack notions of "the public" or "the community". However, I'm not sure that they are leading edge. The latest report isn't available online, and I'm not sure I would venture £10. I wonder if this blog qualifies me for a press copy? Worth a try. IWire reports that Keith Hampton is interviewed in Spectrum magazine, about his new findings on local neighbourhood internet use. Keith revealed some of this evidence at an iSociety seminar back in April. The main conclusion hightlighted is that "rather than destroying community life, being wired actually helps people connect. In fact, people who frequently use e-mail are more likely to be in frequent touch with others by telephone and in person, too."